More and more people - more and more city dwellers. A major percentage of the world’s population now already live in major urban centers. Since 2007, for the first time in human history, more people live in cities than in the countryside. Everyone is talking about urbanization and megacities. In 2012, the biggest Swiss children’s charity Pro Juventute carried out a representative survey of several thousand children, asking them what their personal hopes were for the future. The desire for more “open space and room to play" came top by a clear margin – way above computer games, sweets and mobile phones. Public space is becoming increasingly scarce as a resource – making its design and use more valuable and relevant than ever. City planners and urban space developers have long recognized that it is public spaces (publicly accessible areas of buildings, campuses, rail stations, airports and parks, squares and pedestrian streets) that have a decisive impact on urban living spaces, stimulating the environment and giving it its own personal identity. margin – way above computer games, sweets and mobile phones. 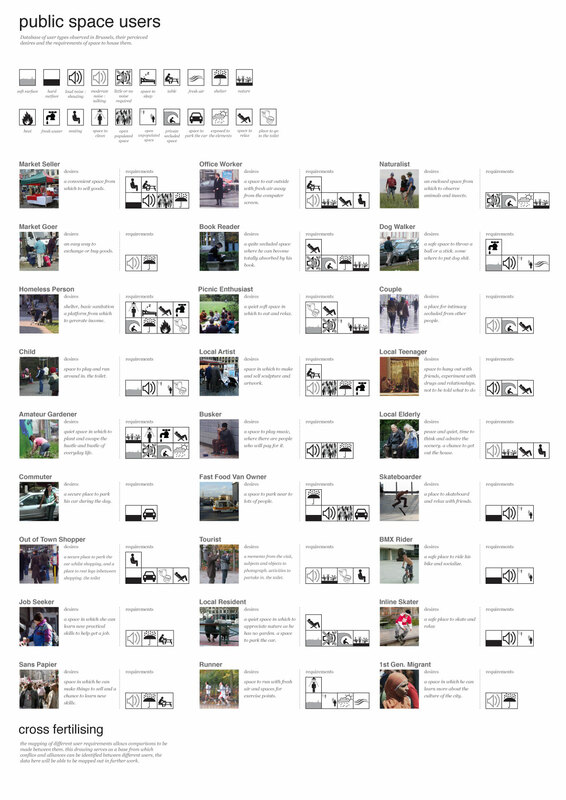 The term “public space” was totally unheard of 20 years ago. Although times have changed since then, the true «power» of open space has only recently been recognized. Public space is a tool for location marketing. Cities around the world have become interchangeable. Apart from a few architectural icons, we mainly perceive the identity of a city (unconsciously) via its Public Elements – road signs and signposts, park benches, waste bins, billboards and information panels and the lighting in public squares. Even if airports around the world are all very similar in terms of basic architecture, we feel «at home» in certain places. Research shows that such feelings if identification a largely generated by Public Elements, especially airport signage. But the branding of public space is revealed most clearly on film sets. In Hollywood, the same building is used as a backdrop for filming a 1920s gangster movie or Spiderman in the 21st century, for example. The Public Elements are what change in each individual case (signposts, traffic lights, waste bins, news paper dispenser etc.). Erkennen Sie die Stadt? Do you recognise the city? Do your own test. Would you have recognized the skyline portrayed without the Public Elements? 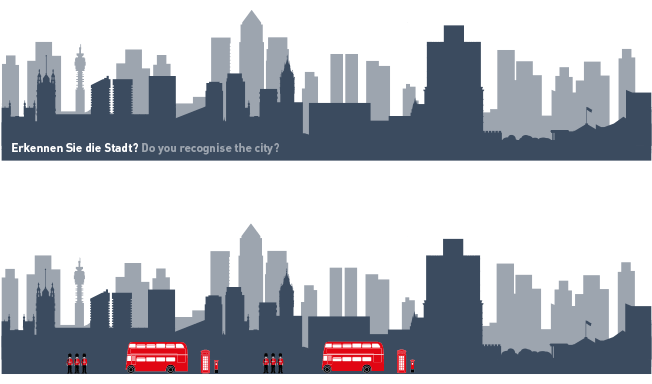 Can you match the Public Elements portrayed to a particular city? The primary task of any city involves social integration for the people living there. Amongst other factors, good social integration is exemplified by a high level of participation in public life amongst the population. This also means that people need to feel safe and at home at a particular location and enjoy a high quality of life when circulating in a public space. Only when people refer to “my” city, experience it as such and take an active part do they bring public space to life with their regular presence, ensuring that other examples follow. 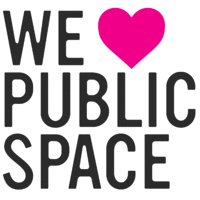 Or, as Amanda Burden (former New York City planner) and Sir Norman Foster (world reknown architect) put it so well: “Public spaces are more important than buildings. They make a city alive." Planning and creating public spaces is both a highly responsible and very demanding task. This is because the needs and expectations of EVERYONE converge in public spaces, and it sometimes seems as if the requirements of the various stakeholders are not compatible. “We just don’t want any problems with public spaces." Owners/managers of public spaces often just don’t want «any problems.» This often leads to big spaces being closed for months (e.g. municipal swimming pools outside the summer season) or larger streets being managed with barriers and fencing, making it impossible to provide space for larger volumes of people or for them to circulate there. On the other hand, residents of public spaces want to experience a high quality of life through the sue of such public spaces. They are looking for an opportunity to take a step back from their (hectic) daily lives, a place for relaxation and leisure, and expect the appropriate layout and design. In their view, public space needs to be a place where different groups of people and different generations can meet and talk. Wherever possible, interaction should not just be made possible, but actively supported and promoted. But public space also needs to be safe, with good signage to guide both locals and visitors alike. A public space needs to promote identification with and a sense of belonging to a certain place (airport) or entire region or create this from the very beginning (e.g. Glattalbahn rapid transport system), generating a feeling of home and security. In brief: down the generations, a public space needs to be a place where people enjoy spending time, feel good in themselves and a place associated with pleasant experiences and memories. The skill lies in meeting both sets of needs at the same time – and this is totally possible. Visitors to cities and major events(e.g. the Olympic Games) are always being asked for their positive and negative impressions of the city or event. 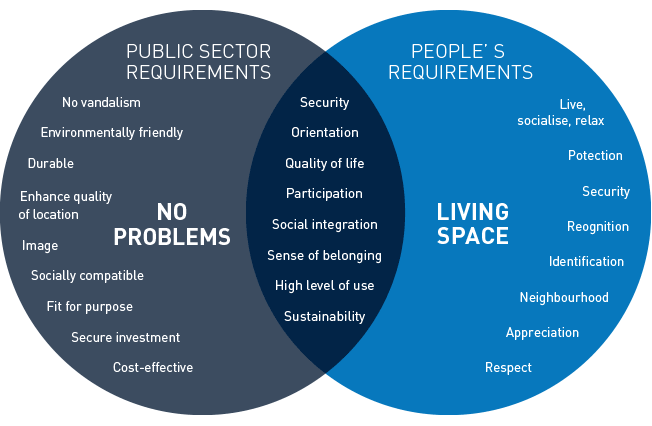 Without exception, Public Elements (benches, signage systems, waste systems, public transport infrastructure, etc.). are always right at the top of the list in these surveys. If badly executed, maintained or completely absent, visitors are left with a negative impression in the best case scenario. Visitors to cities and major events(e.g. the Olympic Games) are always being asked for their positive and negative impressions of the city or event. 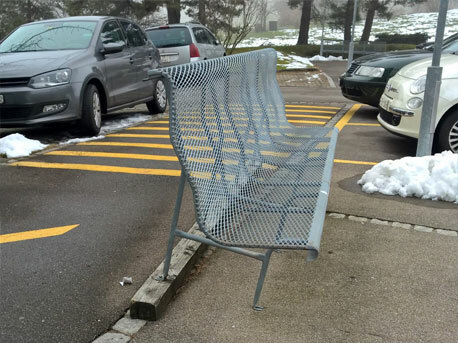 Without exception, Public Elements (benches, signage systems, waste systems, public transport infrastructure, etc.). are always right at the top of the list in these surveys. If badly executed, maintained or completely absent, visitors are left with a negative impression in the best case scenario. But it could even end in the public space «emptying» and a feelings of being unsafe and anxiety (I didn’t dare go out into the street after dark) and ultimately the decision never to visit the city/event again or leave the region. 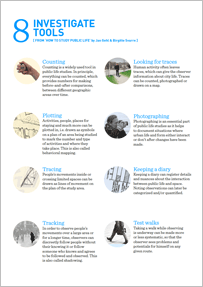 The configuration of public space therefore has a major influence on the perceptions of the people using it. Major importance often also suggests major costs, but this is simply not the case with Public Elements. 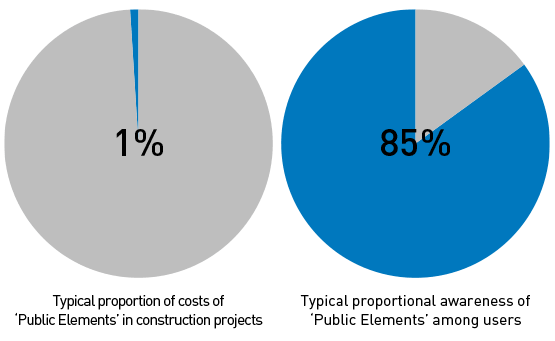 For example, when you set the amounts invested in all the Public Elements against all of the construction costs for the Sochi Summer Olympics, a new airport or a new park, they never come to more than 1% - 2%. This means that the investment that has the biggest influence on the positive (or negative) perception of the target group of a public space is often proportionally the smallest cost item of the entire project. Or put even more succinctly: if you try to “optimize” the 1% share of the costs taken up by Public Elements, you run the risk of compromising the overall perception and therefore the use of everything invested in construction. During a project, ‘savings’ are often made at the purchasing stage on the assumption that items will soon be replaced. However, cities and municipalities generally only have the will, time or budget to deal with such projects once every 20 years or so, not least because the majority of subsequent ‘improvements’ to the public space meet a negative response soon after introduction. Indeed, these kinds of public works are often openly acknowledged as construction errors – poison for the career of any politician. Moreover, every replacement job requires further civil engineering work, foundation works, supply lines, yet more replacements, and removal. This is extremely costly in the long term and often results in a patchwork of surfaces and infrastructure. In addition, such an approach necessitates further construction permits, expensive safety measures, blocks and deviations, and a longer period of restricted use for local residents. In general, no genuinely new investment can take place, and because they only have a brief period in which to complete their task, the respective providers must also undertake repeated maintenance work on low-cost elements. As well as being extremely costly, this leads to problematic elements being mended only in order to fulfill minimum requirements. ‘Patched up’ and substandard elements are not valued by the general public and fail to generate feelings of identification, resulting in a lack of participation. 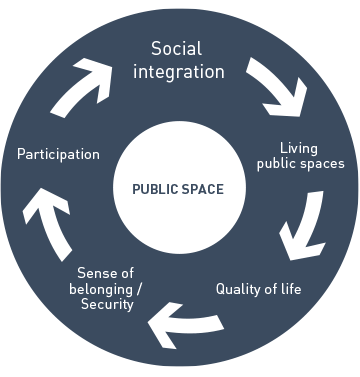 In turn, this hinders the development of social integration – the public space is perceived as ‘poor quality’ and is unable to fully assume its intended function. 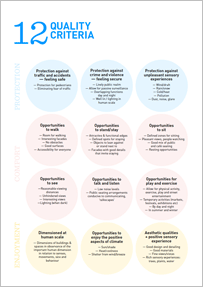 From all these considerations, it is important at the very beginning of the process to define the objectives for the respective public spaces, and in the acquisition of Public Elements to place lifetime costs and not acquisition costs in the foreground, as well as the ability of the elements to achieve the objectives. Priorities can then be laid out accordingly.